The purchase of luxury goods in Singapore has been on the rise. Take a walk around the streets of Singapore and one can see many people carrying branded goods. Louis Vuitton, Burberry, Chanel, YSL, Rolex, you name it. It is clear that Singaporeans like the finer things in life. Other common purchases are designer apparel, luxury watches, luxury footwear, designer jewelry and accessories, premium fragrances and cosmetics and even luxurious fine dining. So, why do people want luxury goods? Why are they willing to spend hundreds or thousands on these products? A growing population of people who are able to afford higher quality and higher priced goods. Growing disposable income as the economy improves. Being aware of latest fashion trends. People want to keep up with the Joneses and be popular amongst their friends and family. Social status. One may feel more confident when they carry branded products. It is not uncommon for people to purchase luxury goods so as to earn recognition, look powerful and be a symbol of achievement in the society. Makes one feel good about themselves. For some people, luxuries are a source of happiness due to their perceived value and the resulting sense of accomplishment. Social Media. Everyone is involved in social media today, be it on Facebook, Instagram, Twitter and more. Seeing others post about their luxury products does influence one to want to carry them as well. Carrying luxury goods has somehow become a symbol of wealth and success. Luxury goods don’t come cheap. A Louis Vuitton bag can easily cost at least $5,000. 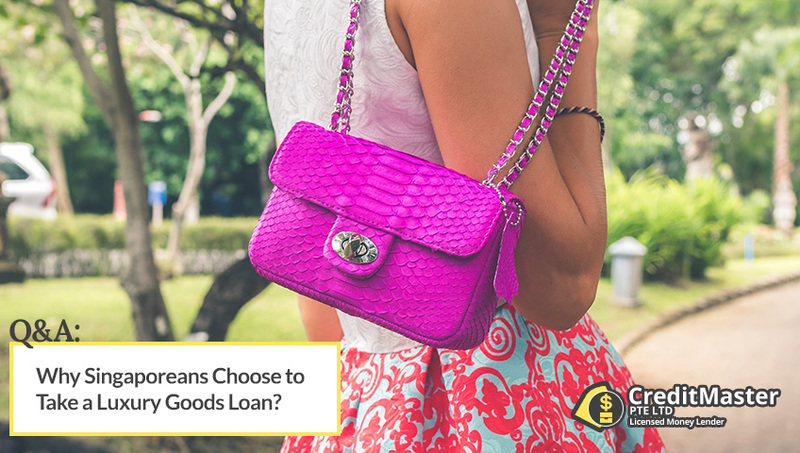 While some people may be able to save up the money needed to buy their luxury items, others prefer to take out a luxury goods loan. They purchase what they need and pay it off slowly. Before we talk about luxury goods loans and what they are all about, have you wondered which are the top luxury brands in Singapore? Which are the most popular ones? It is most likely that one has heard of at least one of these brands. And, they have probably seen their family, friends or colleagues carrying these branded goods. People wearing a Cartier bracelet, carrying a YSL bag, a Marc Jacobs wallet, using an LV wallet or using a Hermes bag. Using such luxury goods boosts one’s confidence level, self-esteem and makes a person feel good. Although getting a branded product can give a sense of fulfillment and achievement, it does burn a hole in the pocket of most Singaporeans. Other than setting aside money for the new bag or wallet or watch, one will still need to cater for their personal expenses and bills. It can get pretty tough especially if the bag that you want is very expensive and you will need to save up for a very long time. Taking out a luxury goods loan means that you will receive a sum of money to purchase the branded good that you’ve always wanted, and pay off the loan through monthly repayments at your own comfortable pace. You can decide the sum of money that you want to borrow. It is possible to get a personal loan to fulfill these needs and customize your repayment plans so that they will not affect your finances too much. While most people would frown upon hearing the word “moneylenders”, there are legal and licensed moneylenders in Singapore who provide loans at affordable rates.  Generally, these financial institutions seek to provide financial alternatives to banks. They are definitely not loan sharks, but are companies that want to help borrowers with their finances. Most of them provide a variety of loan packages and faster approval rates. Shorter approval time, which means that you will have the money sooner. The lender does not designate how the money is to be used. You can use the amount for any of your personal purpose. You don’t always have to go through the tedious process of borrowing from banks. Less paperwork and shorter processing time. Most of the loans can be applied online as well. Applicants get to decide on the amount of money that they want to borrow. Flexible repayment terms. Borrowers can choose the repayment amount and loan tenure. Loan tenures range from 1 to 5 years. The interest rates for these luxury goods loans are lower than what one would pay for their credit card. Licensed moneylenders offer unsecured loans. This means that no collateral is needed. Why an Unsecured Loan? What are Unsecured Loans? An unsecured loan means that one does not have to put up collateral in order to borrow. The borrower’s integrity is what the lender relies on. Of course, one must prove that they are able to repay the loan, so supporting documentation is needed with the application. In Singapore today, one is not only able to borrow from regular banks, but also from licensed moneylenders as well. Traditional banks generally have a longer process, while licensed moneylenders expedite their process so that you can get your money quickly. In fact, did you know that credit cards are also unsecured loans? They have always been very popular in Singapore and many people tend to use them for their bills and shopping. However, the interest rates on credit cards are much higher than what one would get by taking a personal loan for luxury goods. This is what makes personal loans a better option than credit cards. Getting a luxury goods loan with licensed moneylenders in Singapore is a swift and convenient process. CreditMaster is a registered moneylender with the Ministry of Law and was established a few years ago. The company realized that not all of the needs of Singaporeans are met, and introduced packages and products that are catered to different uses. Applications and enquiries can even be made online! A Singapore citizen or a Singapore permanent resident. Foreigners are welcomed to apply as long as they submit their employment pass. Before taking a loan, one should always be clear of how much they want to borrow and how long they plan to take to repay. As tempting as it gets, it is not advisable to take the maximum loan amount. Apply for an amount that you are comfortable with repaying. Remember that you still need to cater for your other personal expenses and bills. Once you have sent in your loan application with the necessary documents, CreditMaster will review the application and get back to you within 24 hours. If you choose to borrow from traditional banks, it might take about a month to get a loan approval. The time period is reduced with licensed moneylenders. Additionally, with licensed moneylenders, you can actually get the money the very next day so that you can make your purchases on time. 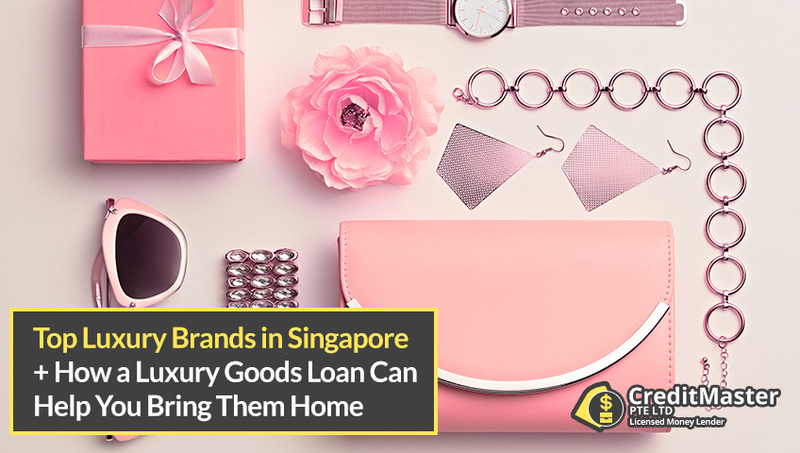 With luxury items flooding the Singapore market and people flooding the stores to purchase them, it is also important to make sure that you purchase items that can be considered assets. Perhaps after some time, you may consider selling your current luxury bag to get a new one. Bags, watches, jewelry are all considered assets. Luxury items, LV, Prada, Gucci, Burberry, are within reach for Singaporeans. As long as you meet the qualifications and plan your finances carefully, you can bring your own luxury good home!